So today, Monday, Jan. 5, I decided that I will use my crock pot at least once a week. I am not even going to bother putting it back under the counter. Be on the lookout for for more crock pot recipes these next couple of months. This one of my family’s favorites. I tried to take a better end picture as well, but no such luck. I actually find food from crock pots very hard to photograph. Everything has cooked all day together and mashed their flavors together. Good for your tummy, but not really photogenic. Maybe one day I will be able to capture a perfect picture of it! 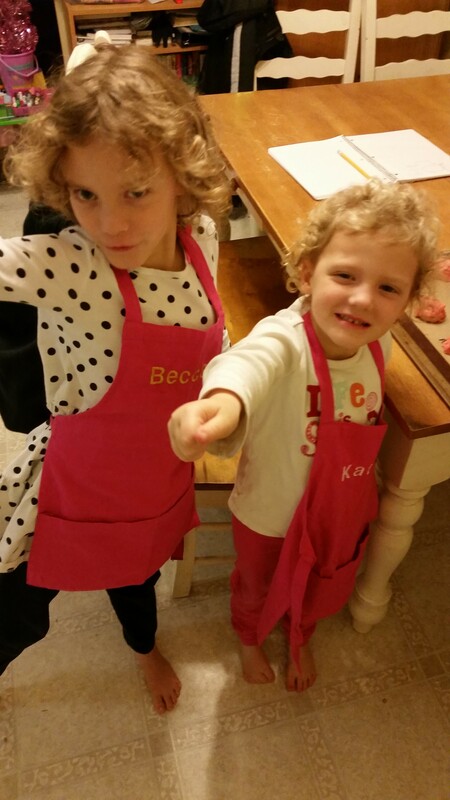 But until then, these cute little sous-chefs make up for it! Season the beef with salt and pepper and let stand (in refrigerator) as you prepare the other ingredients – let stand for up to two hours. Brown the meat in your pan. Let it cool and add it to your crock pot. Cook your chopped onions, garlic, and sliced mushrooms in the beef drippings with a few shakes of olive oil. You can prepare this part the night before and put in your fridge until the morning. In the morning, add your Worcestershire sauce and beef broth. Cook on low for 6-8 hours or high for 3-4 hours. Near the end, add your peas. Make a slurry by whisking your flour and a tablespoon of the liquid from the crock pot together. Add that and your room temperature cream cheese (or sour cream, or combo of each. Cook egg noodles and add all together at the end.